Before I get into the details of this particular workout, I think it is worth taking a moment to help put some perspective on harder training days. Anyone who has ever raced ANYTHING (swim, bike, run, etc) that has a duration over a couple minutes has experienced the discomfort of sustained aerobic/anaerobic activity. If you are really pushing yourself and racing hard, you know that the shorter the distance/duration, the greater the discomfort. A close friend and well known Chicago area runner/triathlete, Tom Estka, would always say that it's tougher to run an all out 5k with your heart rate spiked for 15 or so minutes, than it is to race a marathon, where you need to find a different type of rhythm and intensity that you can sustain for a couple of hours. That said, "hard" days of training focus, at least mentally, on your ability to be "comfortable, with being uncomfortable". That's what I tell my athletes, whether they are running an all out 800m dash, to a 3 mile cross country race, or when I am doing a workout to prepare for a powerman duathlon. The best athletes have a great ability to tolerate discomfort, and almost welcome it to a point. Hard workouts are simply opportunities to train yourself to be "comfortable with being uncomfortable". 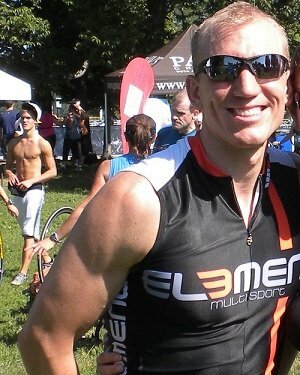 The workout I am going to share with you now is one that I was given by my childhood friend, now turned professional triathlete and coach, Jim Lubinski. (Who by the way once told me that during a race, when his body would tell him to slow down, that was when he would push harder! Talk about being comfortable with being uncomfortable!) This is a workout I like to do every other week in the months leading up to a big race, as it gave me confidence to see my times drop each time and feel pretty good running slightly faster than my projected race pace. For this workout, you need your tt bike, trainer, your racing flats, and immediate access to run off of the bike in a safe area. I sometimes bring all of the above to the local track and complete the workout right on the track. The workout begins with 20 minutes of warm up on the bike. This should include some 1-leg spin drills, some 30-1 min pick-ups, etc. After the 20 minute warm up, you proceed right into 10 minutes of a strong effort, not all out, but a solid 40k TT type effort. You should definitely feel uncomfortable during this effort and focus on maintaining cadence 85-95 rpm. Once the 10 minutes is up n the bike, you transition into your running shoes (yes, wear your racing flats and use the same gear you plan to race in so as to build some muscle memory into the transition). Now it is time to run 10 minutes at a strong effort. While this is not all out, I definitely try to push for a faster pace than my current 10k shape, and will try to push harder as the 10 minutes progresses. For instance, off of the bike, the first minute or so might be a bit slower as my legs get used to running, then as I get loose, build into 10k pace, then try to continue to get faster finishing the last minute or so nearing 5k pace. If doing this on a track, it's nice to see how over time you might be able to squeeze another lap in the 10 minute interval over the course of a few months of trying this workout! Once the 10 min run effort is done, you jump back on the bike for 10 minutes, and repeat so that you end up with 4 x 10 min efforts on each the bike and run. repeat 10 min bike/run 4 times, so you end up with 40 min of hard riding, with 40 min hard running. Depending on what you are training for, you might choose to do fewer reps (sprint races), or do more reps at a lesser, more appropriate intensity (half iron or iron). This duration and intensity is appropriate for Olympic distances. I don't have a power meter on my bike, but clearly, the use of one could help you maintain appropriate wattage for the bike effort to keep you honest. I hope you might find this workout helpful as you prepare to be "comfortable with being uncomfortable" during your next race!